Various groups made it an excuse to create controversy. A Bible and a Quran was placed next to Bhagvat Gita for secularism. On 27th July, Prime Minister Narendra Modi inaugurated the memorial dedicated to India’s ex-President and ‘missile man’ APJ Abdul Kalam on his 2nd death anniversary. This memorial was built by a dedicated force of 450 workers, who had demanded no extra money even though they had worked for extra time. The memorial has unfortunately resulted in various political and fringe groups using it as a pretext to create a religious controversy. 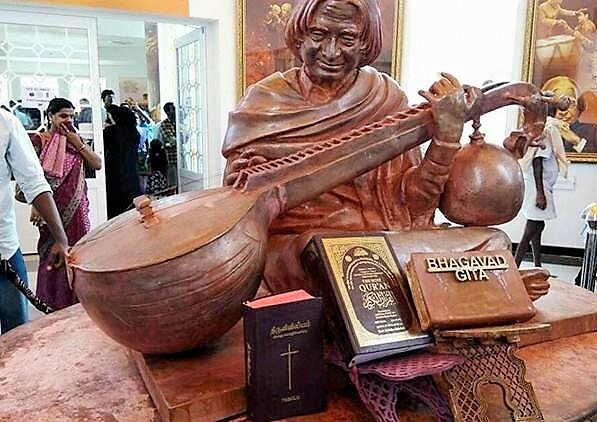 Initially, a Congress leader had questioned the need for putting a Veena in Dr. Kalam’s hand because he was a missile man and not any Veena artist. The truth is that Dr. Kalam was an expert playing that instrument, a fact that seems to have escaped the leader’s knowledge. Another controversy erupted when political groups like the MDMK started questioning the presence of Bhagwat Gita in the statue. To quell the controversy, family members of Dr. Kalam also placed a copy of the Quran and Bible each to apparently ‘secularise’ things and also promised to place the Thirukkural soon. This in turn led to a protest from Hindu Makkal Katchi, which lodged a police complaint about the Quran and Bible getting placed near the statue without proper authorisation. They also reportedly protested in front of the memorial which led to the cops removing the two holy books. Now a Muslim group named Tamil Nadu Thowheed Jamath has decided to take things to a new low by making defamatory personal remarks against Dr. Kalam. The Jamath claimed that Quran was not needed in front of the statue of Kalam, as he was not a Muslim. The group claimed that Dr. Kalam just had a Muslim name, and not a real Muslim because he apparently prayed to Hindu idols and gurus. Incidentally, this is not for the first time that Dr. Kalam has been denied a Muslim identity. Way back when he was declared the Presidential candidate by the NDA, senior Congress leader and Muslim scholar Dr. Rafiq Zakaria too had declared that Dr. Kalam can’t be considered a Muslim as his favourite scripture was the Bhagvad Gita, and favourite deity was Krishna. The bomb blasts in Sri Lanka which have killed over 200 people are markedly different from Christchurch shooting of only a month ago.